In this post I’m going to share with you one of the best social sharing plugin for a multilingual WordPress site, that can help you boost the reach of your content and make all of the hard work you’ve put in. Finding a good social sharing plugin for a multilingual WordPress site is more difficult than it should be. The problem is that most social share buttons are usually generic and give no control over internationalization, localization and translation features. After looking for a few months, I’ve found a perfect plugin for social sharing in multilingual WordPress sites. It’s called Easy Social Share Buttons. I’m using it in this website. Easy Social Share Buttons is a social sharing plugin that provides an incredible level of customization. There is support for many social networks around the world. You can display social share counters in 3 different positions or turn them off. There’s also URL shortener support for Goo.gl and Bit.ly, and a recent feature has enabled the ability to track all of your social sharing metrics across popular social networks right from your WordPress dashboard. Easy Social Share Buttons supports the most important social networks around the world: Facebook, Twitter, Google+, Pinterest, LinkedIn, Digg, StumbleUpon, Tumblr, Buffer, Delicious, Reddit, Pocket, Flattr, ManageWP.org, WhatsApp and Love You button. VKontakte. The largest Russian social network. It is very popular among Russian-speaking users around the world, especially in Russia, Ukraine, Belarus, Kazakhstan and Uzbekistan. Weibo. One of the most popular social networks in China with a market penetration similar to the United States’ Twitter. Xing. A professional networking tool. It is very popular in countries like Germany, Austria and Switzerland. Xing is similar to LinkedIn. Odnokkassniki. It’s a social network service for classmates and old friends. It is very popular in Russia and former Soviet Republics. Menéame. It is a Spanish social news site based on community participation, made for users to discover and share content on the Internet, which are voted and commented upon. Its model is based on Digg. This plugin allows you to hide or show selected native buttons in each article. 22 social networks in Easy Social Fans Counter. Localization Settings allows you set buttons to appear on your native language. 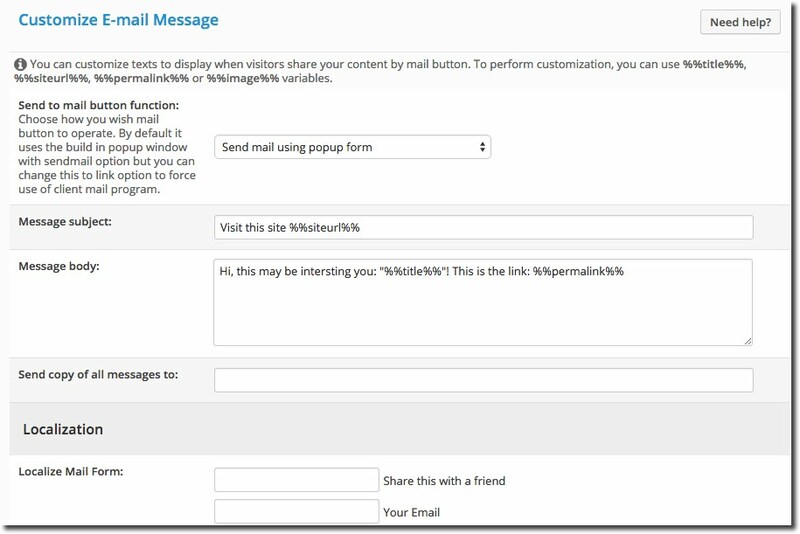 You can provide language code for native social networks and localized message that will appear when you point share button. In conclusion, Easy Social Share Buttons is an excellent social plugin and the best option that I’ve found for a multilingual WordPress website. 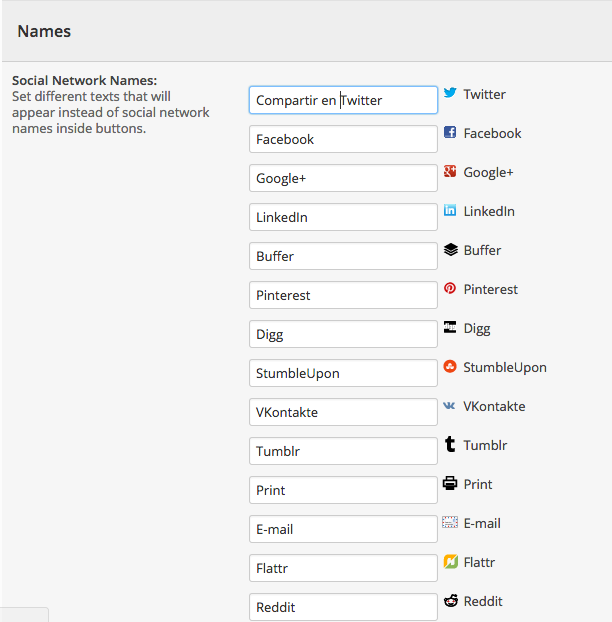 You can test this plugin sharing this article in your social networks. Thanks!